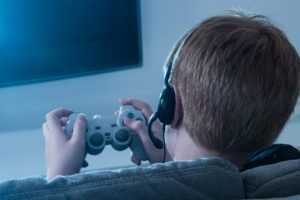 Fortnite, it’s the newest craze in online gaming and is proving incredibly popular. It has been around for a while on PlayStation 4, Xbox One, Windows, and Mac but recently added iOS to this list. The main game focuses on a Save The World mode where you attack and shoot enemies with weapons and build defences. The statistics around Fortnite are pretty astounding. The game is believed to have about 45 million registered players, with up to three million people playing it at any given time. Gaming analytics website Matchmade has indicated that Fortnite has now surpassed Minecraft in terms of popularity on YouTube. So, what can you do to help your child to stay safe if they play Fortnite? In the UK the Video Standards Council rate Fortnite as PEGI 12 for frequent scenes of mild violence. It is not suitable for persons under 12 years of age. There are elements of the game that are not covered by a rating, for example, the interactions with other players online and the potential use of bad language. Although the game isn’t rated for profanity, its online nature could expose younger players to offensive language from random strangers via the voice or on-screen text chat. The NSPCC in the UK have offered advice for parents amid concerns over a game function within Fortnite that automatically allows users to speak to other players through voice and text chat functions. It means children can be contacted by anyone else who is playing the game. Users can disable voice chat in the game via the settings menu, but the text chat function cannot be turned off. The team at Zeeko would absolutely concur with this advice. There really is no substitute for regular conversations about online safety with your children. Where games like Fortnite and similar are concerned it’s a good idea to familiarise yourself with the functions of the game and to regularly check in with your child even while they are playing. We advocate active mediation at Zeeko which will undoubtedly be an important tool when it comes to managing time spent playing interactive online games. Active mediation relates to creating an atmosphere of open communication where your child is secure in the knowledge that they can come to you to discuss what they are experiencing when they are online, without a fear of being punished. Keeping the lines of communication open is crucial when it comes to staying safe online, regardless of the game that is being played. Given the speed at which the online world moves there will always be new craze. If your child has a solid foundation of knowing how to make smart choices online coupled with an open communication style at home, they have a head start in staying safe online!